Established in 2002, we offer the complete eyecare service, anything from routine eye tests, new spectacles, sunglasses and contact lenses to frame repairs, accessories and sports eyewear. Aftercare service is important too; we are always happy to see you in the practice to adjust your glasses if they’re not perfectly comfortable or have suffered a mishap. 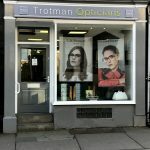 This year we have updated our name from Hollinshead and King Opticians to Trotman Opticians. We still provide the same excellent service. Being an independent Optician means we can offer spectacle frames, lenses and contact lenses from an extensive list of suppliers. This allows us to ensure the product we supply matches your requirements. Many brands such as Zeiss and Silhouette only supply to independent opticians. We have an extensive range of spectacle frames to choose from; something to suit everyone. Your Eyes are Our Business!